An extraordinary crop circle formation was found in the Netherlands on August 7th, 2009 near the town of Goes, Zeeland. 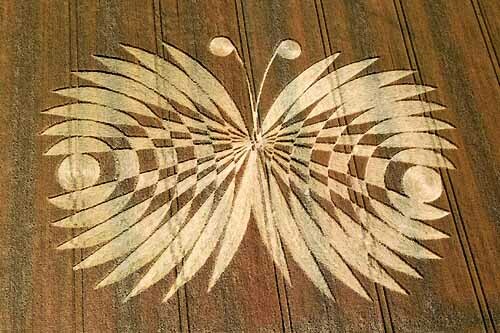 The crop circle patterns formed a design of a human butterfly symbol. It is an incredibly large butterfly with Da Vinci's 'Vitruvian Man' in the center, depicting the metamorphosis of the Caterpillar into a Butterfly. The crop circle had a width of 1770 feet (540 meter), a height of 1500 feet (450 meter). It covered an area of approximately 60 acres (250.000 m2). The entire Human Butterfly formation contains 81 circles in its entirety. The initial discovery of this crop formation was reported by professional aerial photographer Joop van Houdt. Many attempts have been made to find out who--or what--had created it, but the origin of this mysterious and magnificant Crop formation remains unknown. 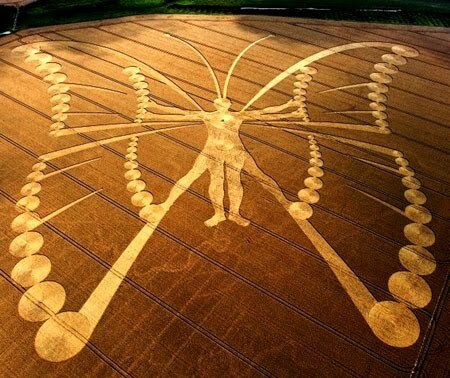 This is the biggest crop circle ever reported and its message is loud and clear, 'Humans are Evolving' , just like the metamorphosis of a caterpillar into a butterfly. This spiritual evolution involves transcending the ego, and quite interestingly when you anagram the word 'Goes' you get 'Egos' Letting go of our egos is one of the first steps towards self-realization / awakening / enlightenment / evolution. Whether or not the crop circle was man-made or has extraterrestrial origins, it is still a powerful symbol and reminder for humanity. The crop circle formation symbolizes the transformation of humanity. The Crop circle was found near Goes, Zeeland. Quite interestingly, the reaaranged letters in the word 'Goes' gives us an annagram that forms the word "Egos". The transformation from caterpillar to butterfly is a metamphor for the transformation of a human being. This is symbolic of the transcending of the ego in order to move forward and evolve spiritually. 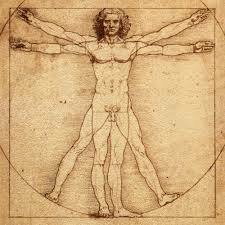 Leodardo DaVinci's Vitruvian Man is an image that represents mankinds connection to nature. The Human Butterfly crop circle can symbolize the profound changes that humanity is undergoing on the planet at this time. In order for us to survive we must learn to relate to nature again and to not destroy the planet. Although modern society has us more connected to each other digitally, we are more disconnected from nature than ever before. Humanity must choose to make this transition to a higher level of awareness and relation to one another in a more meaningful way. Otherwise, we will have to undergo many trials and tribulations in order to 'wake us' up. The Human Butterfly reminds us again that we are all a part of nature. We must put our ego and selfishness aside and begin to co-create a better world. We must remember to have a deep respect and appreciation for all of life and our relationship to it. It's time for us to transform.